Our day began with an incredible breakfast at the B&B—fresh fruit bowl, then eggs, broiled tomatoes, sautéed mushrooms, veggie sausage and toast. Delicious! A $30 breakfast at a hotel in the U.S. It was deliciously prepared, artfully presented, and served steaming hot. We started the day looking for the railroad station because we thought we’d find a telephone to check voice mail and internet access to check e-mail. We did find telephones in the station but decided it wasn’t the greatest location because the loudspeakers regularly emitted announcements about arrivals and departures while we were trying to hear messages. We were able to discover the location of an internet café nearby. With 20 minutes access for £1, we checked e-mail and sent one out to family and friends. Having completed our communications routine, we walked to the Bath Abbey. 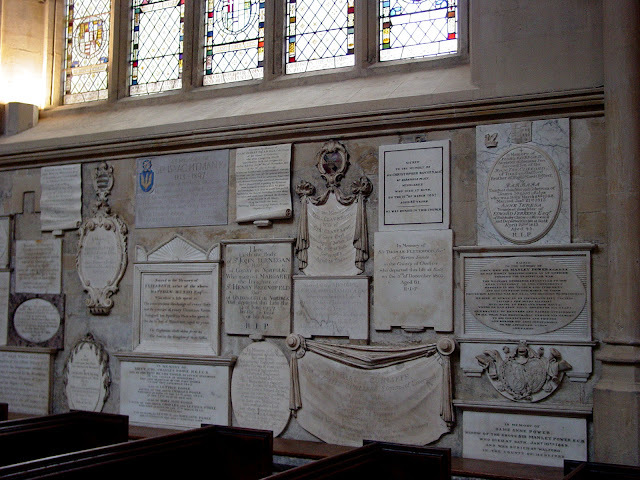 Like Westminster in London, the abbey is architecturally beautiful and interesting, but most captivating are the monuments (back to the 17th century) to the people who are interred there or nearby. 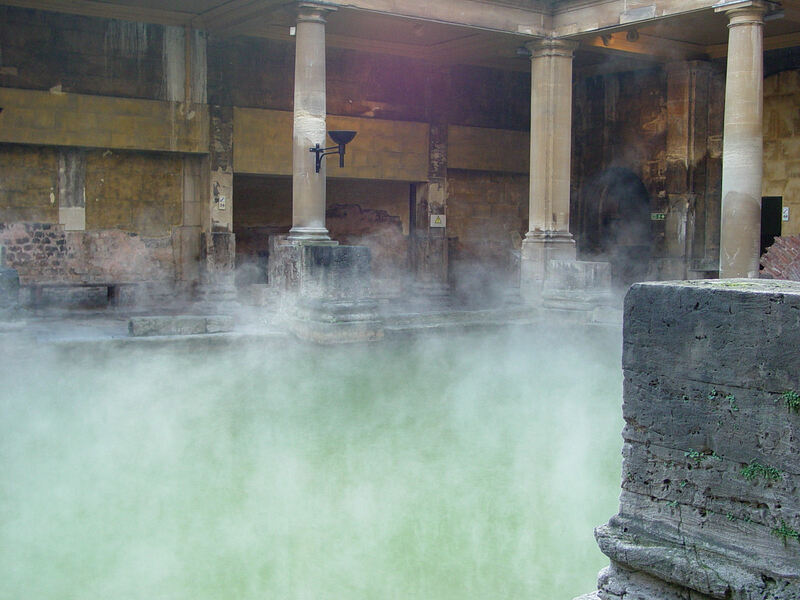 After the abbey, we visited the Roman baths—stone remains of a religious spa dating from c. 45 A.D. The remains have been very well preserved, and the exhibits depicting life between the 1st and 5th centuries were fascinating. Leaving the baths, we were walking along the street when a telephone store caught our attention. We entered and inquired about renting a mobile phone for a couple of weeks. Soon we had purchased a “pay-as-you-go” phone. The salesperson assured us that we could receive calls by just having the number dialed with no country code. We put that to the test from a pay phone, using an AT&T calling card to simulate a call from the U.S. It didn’t work. After unsuccessfully trying various other scenarios, we left to return to the phone store. Along the way, we stopped at a small cafe for tea, where we took out the directions (no help!) and reasoned through what we had learned on the internet about international dialing. Using “exit codes” and “entrance codes” we had read about, we tried again and finally met with success. Again using the AT&T card to simulate dialing from the U.S., we needed to dial 011 to “exit” from the U.S., +44 to “enter” the U.K. and then the phone number minus its initial zero. We returned to the internet cafe to email the number to family and friends—with directions. Background music at the cafe was the very familiar James Brown, a favorite of the manager (and Ken). By this time we finished our emailing, it was about 4:30 and after sundown. On our way back to the B&B, we began shopping in shops and collecting items for dinner in—a bottle of wine, a fresh baguette, tomato, cheese, and fruit—and a two-litre Diet Coke, of course. All our activities today were on foot, a nice break from driving for Ken. Walking distances were modest, and pedestrian traffic was heavy. Is this the reason we saw no obesity in Bath? We keep feeling as if we stepped through the looking glass when we arrived because so many things here are the reverse of the way they are in the States. Driving and walking on the left, toilet flush handles on the right side of the tank, hot water handle on the right and cold on the left on lav sinks, and so on. Are more Brits left-handed than Americans? After enjoying our meal in the room, we had early baths on our last night in Bath and made plans for tomorrow.